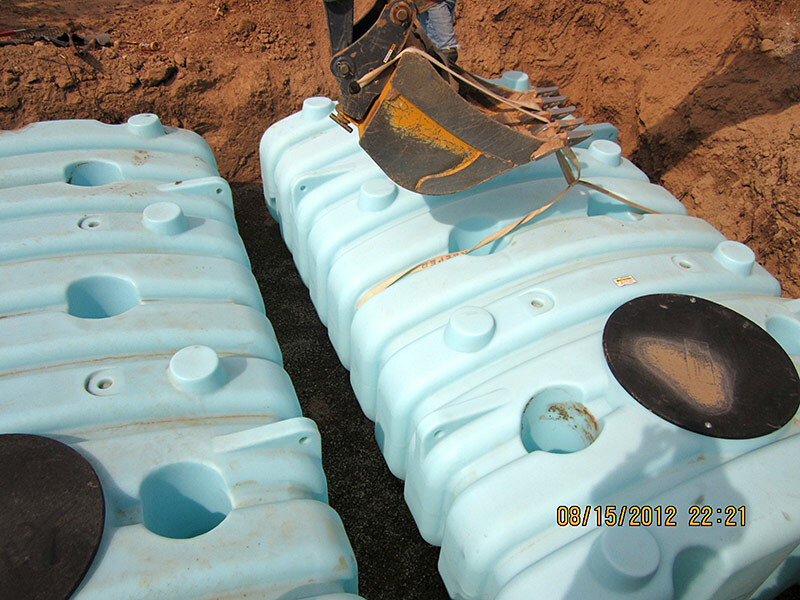 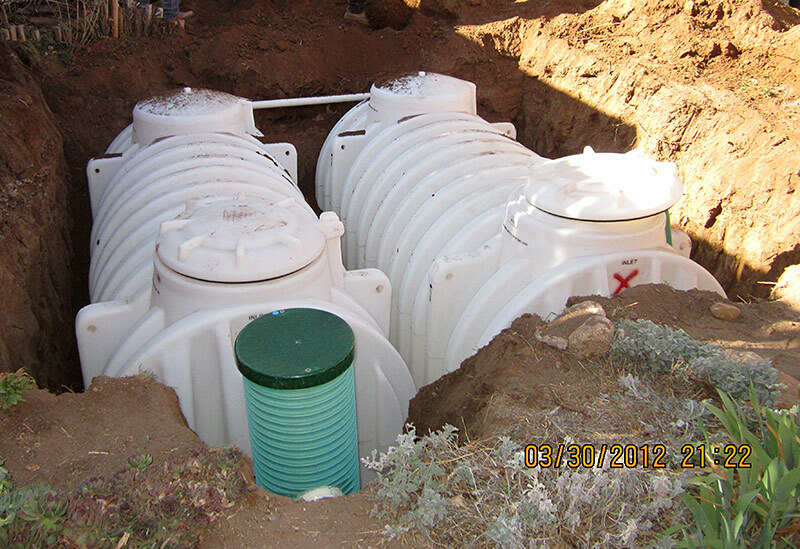 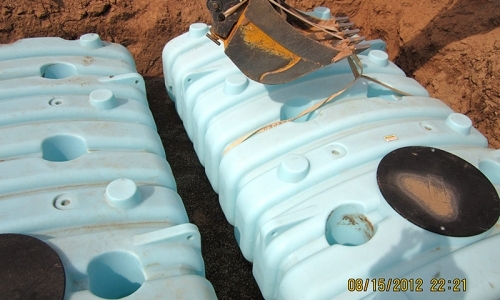 Cisterns come in all shapes and sizes for use above ground or buried below ground and out of sight. 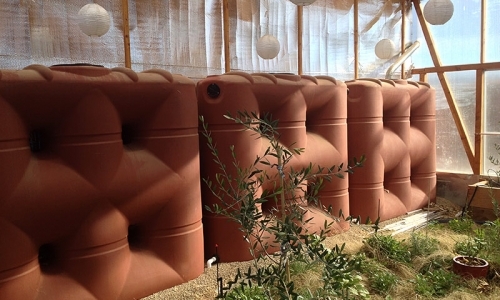 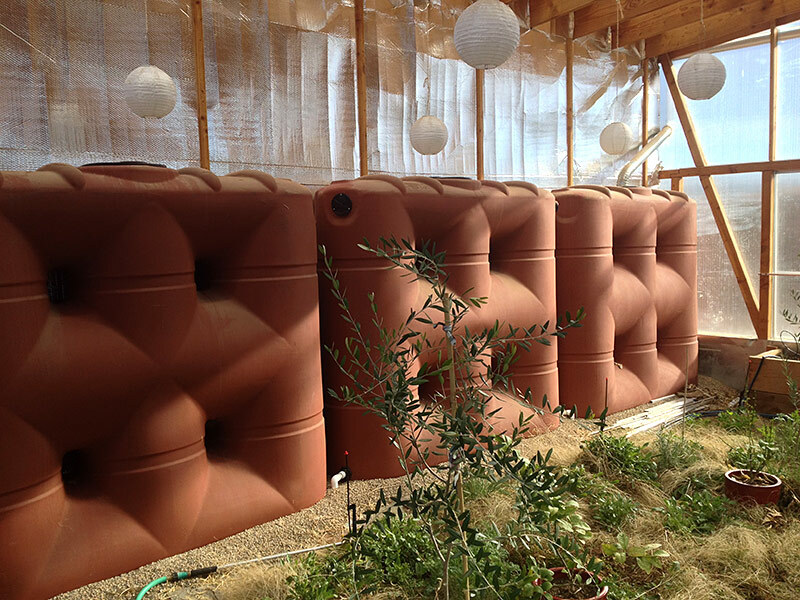 Capturing free rainwater from your roof and other surfaces and storing it to be used for irrigation, drinking, or additional purposes makes sense in our high desert climate. 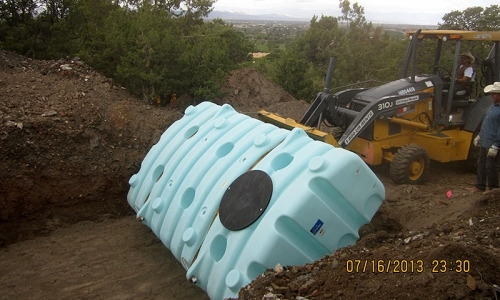 Here are some examples of cisterns The RainCatcher has installed ranging from hundreds of gallons to many thousands of gallons in capacity. 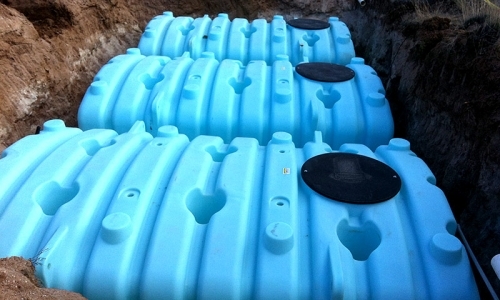 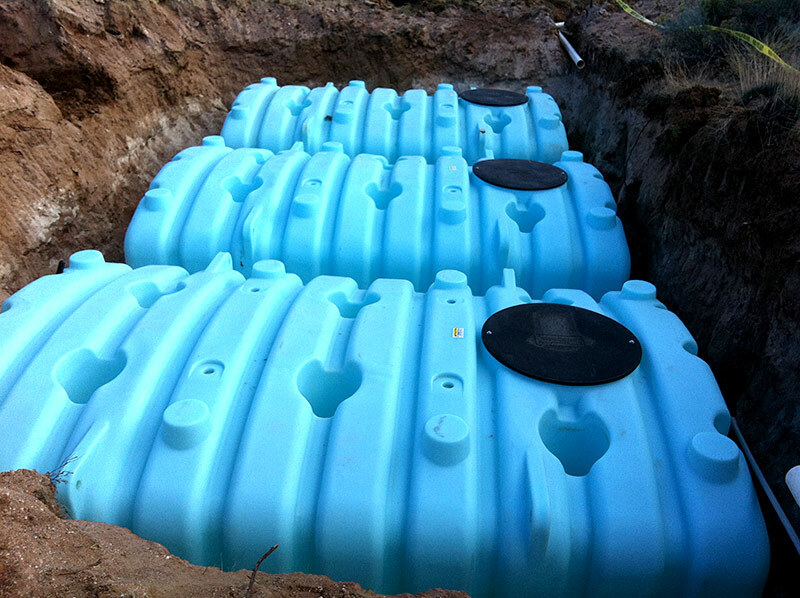 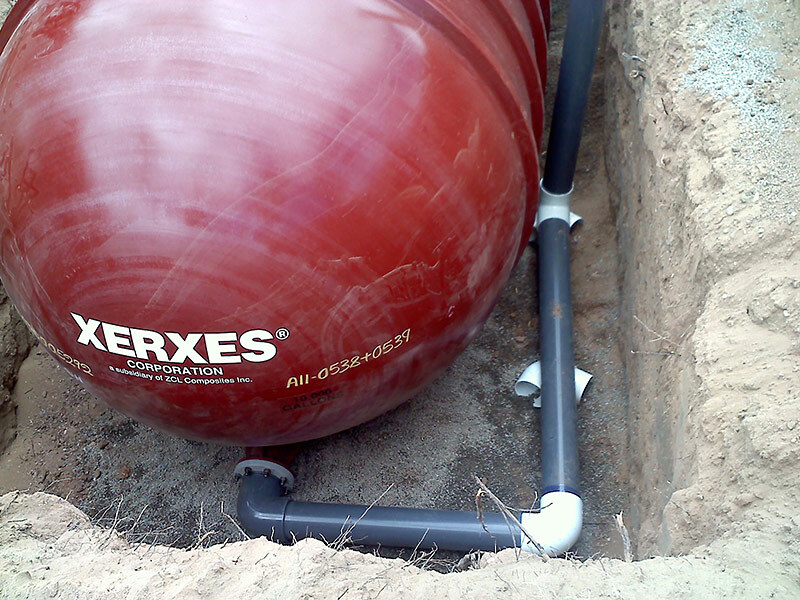 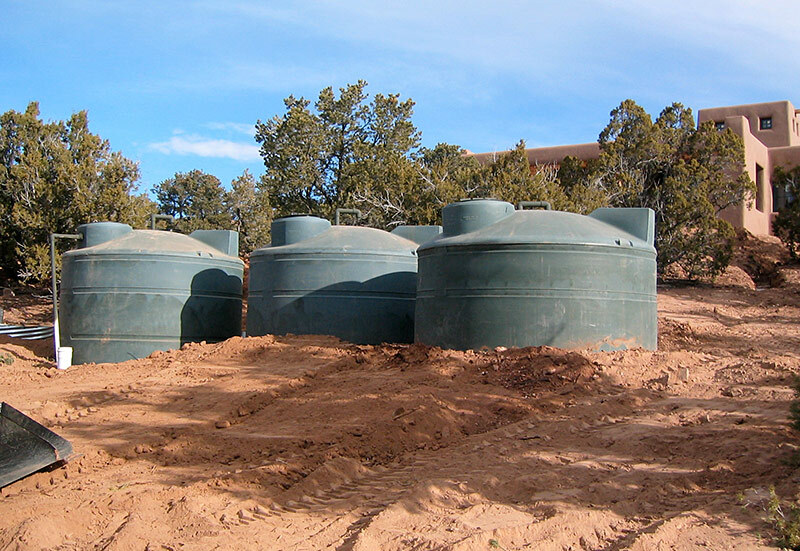 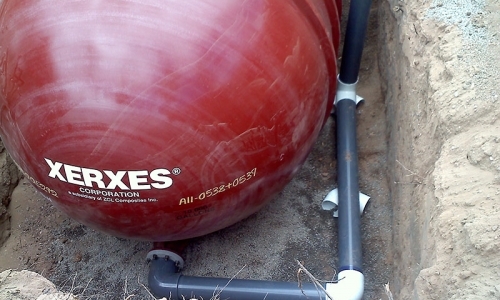 Give us a call for a free consultation to explore possibilities for storing your property’s rainwater in a heavy-duty above ground or below ground cistern. 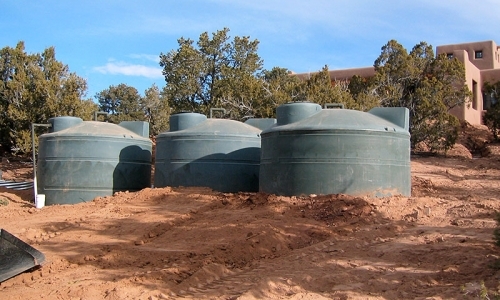 Two 1,700 gallon cisterns with a prefilter in the foreground. 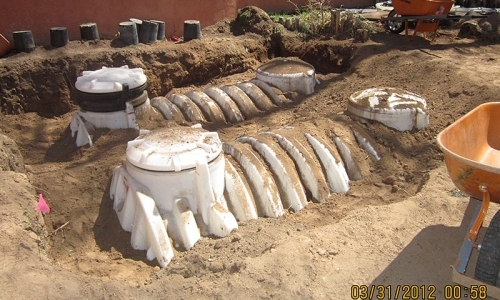 Plumbed together & buried, the 2 cisterns have a total storage of 3,400 gallons. 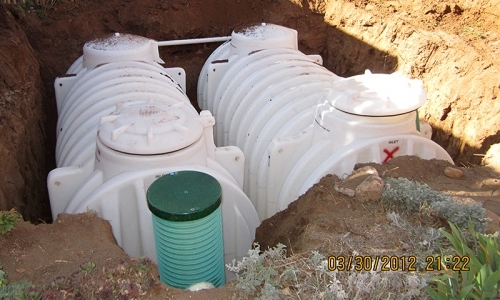 Three 3,000 gallon above ground cisterns with all fittings below the frost line. 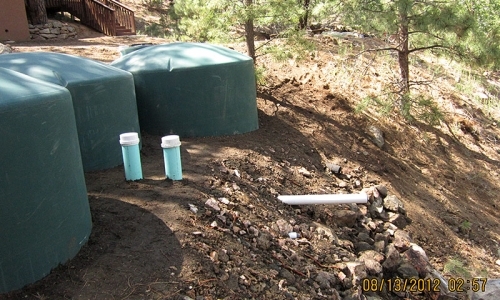 Another set of cisterns, each 3,000 gallons with overflow. 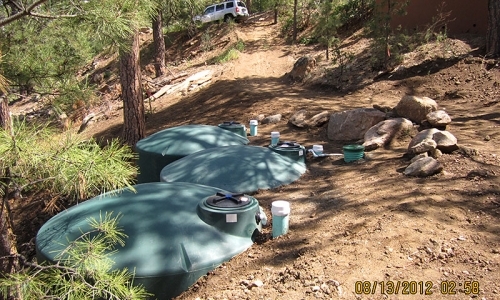 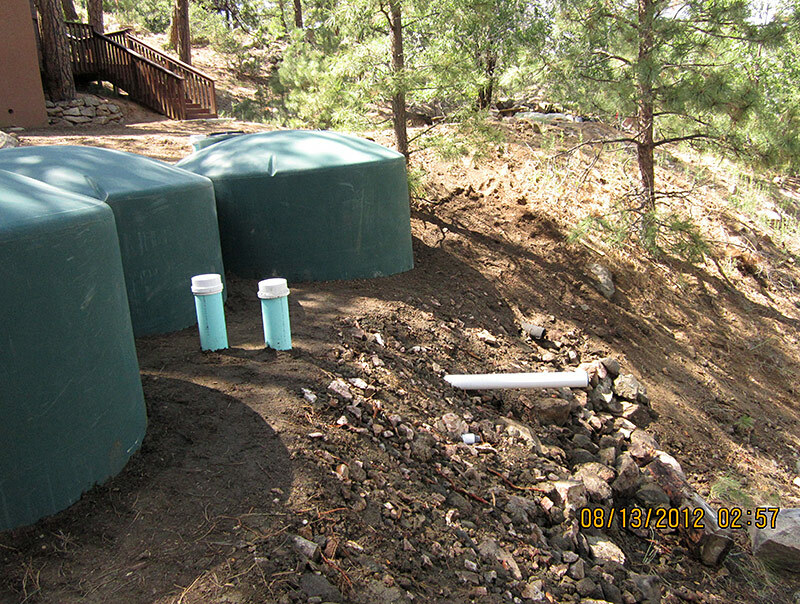 Three 3,000 gallon above ground cisterns partially buried and set into a hillside. 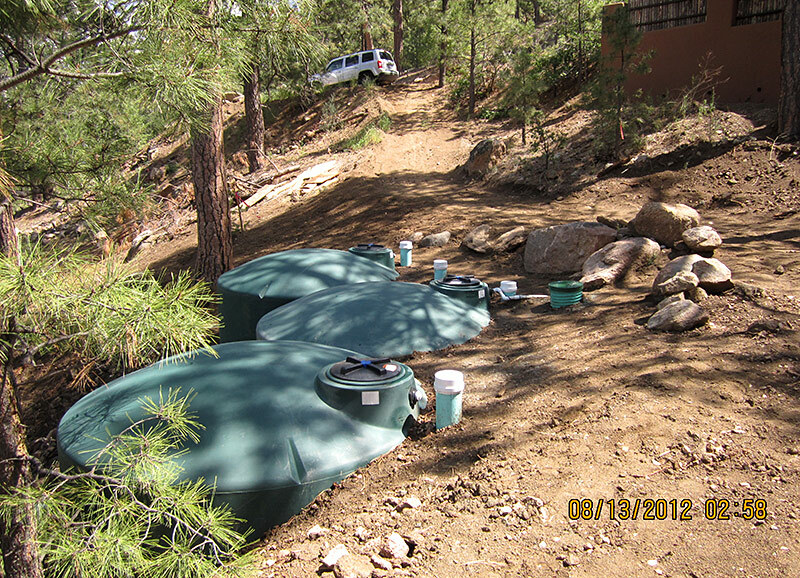 Three 650 gallon storage tanks gravity feeding new plantings in the greenhouse. 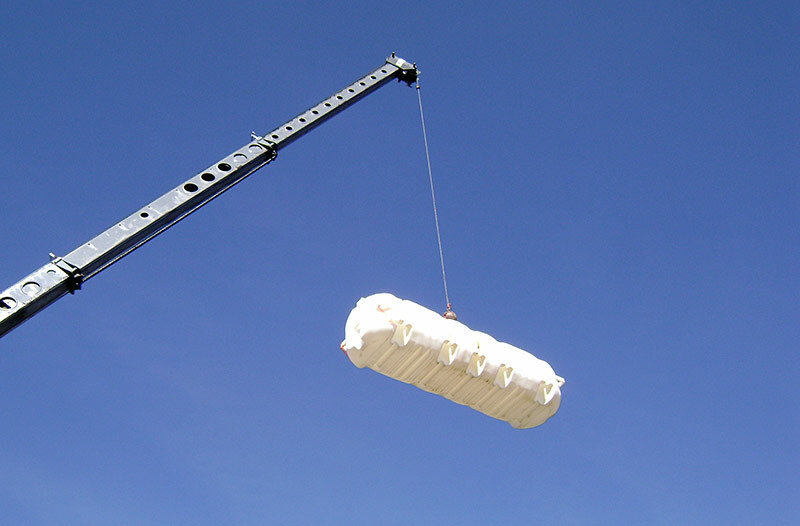 In tight situations, cisterns need to be hoisted into place by a crane. 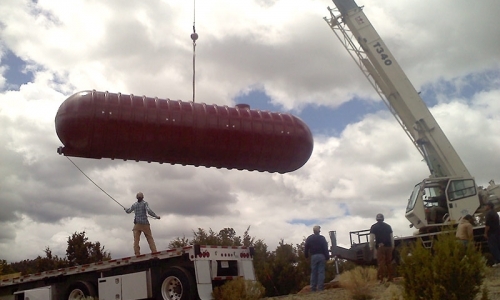 15,000 gallon fiberglass cistern being transported by a crane. 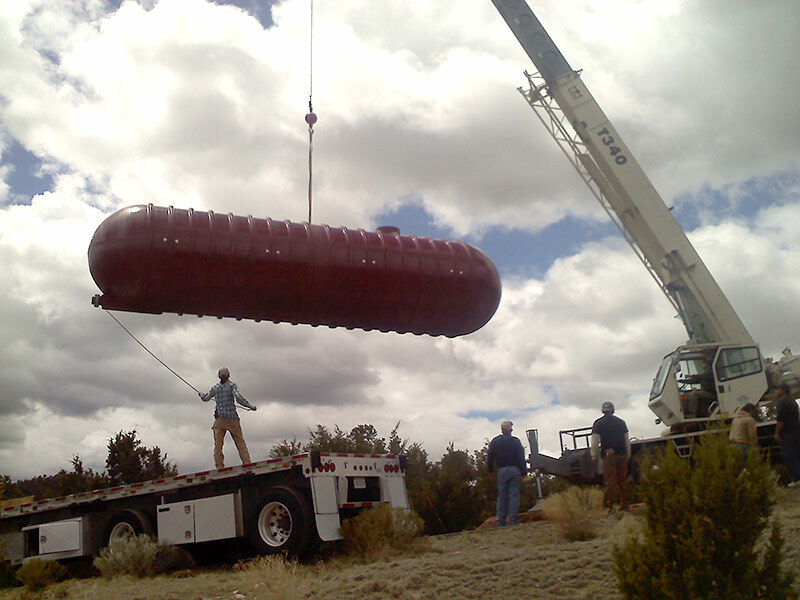 Guiding a 15,000 gallon cistern into place with a crane and ropes. 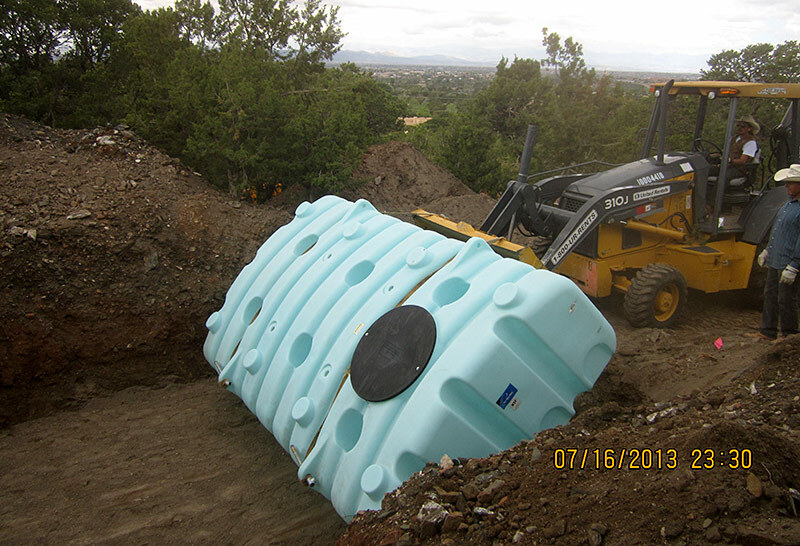 15,000 gallon cistern plumbed for fire protection and used for irrigation as well. 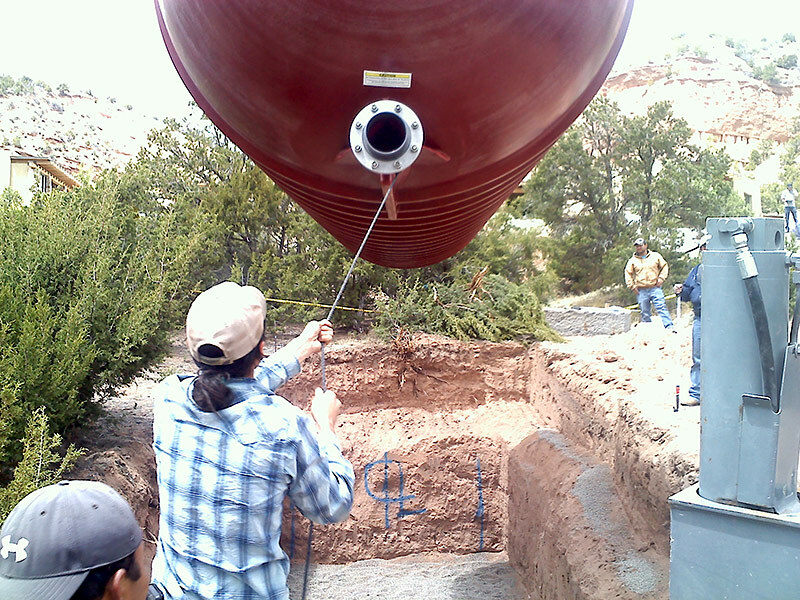 Gently moving a 2,500 gallon cistern with a backhoe into place. 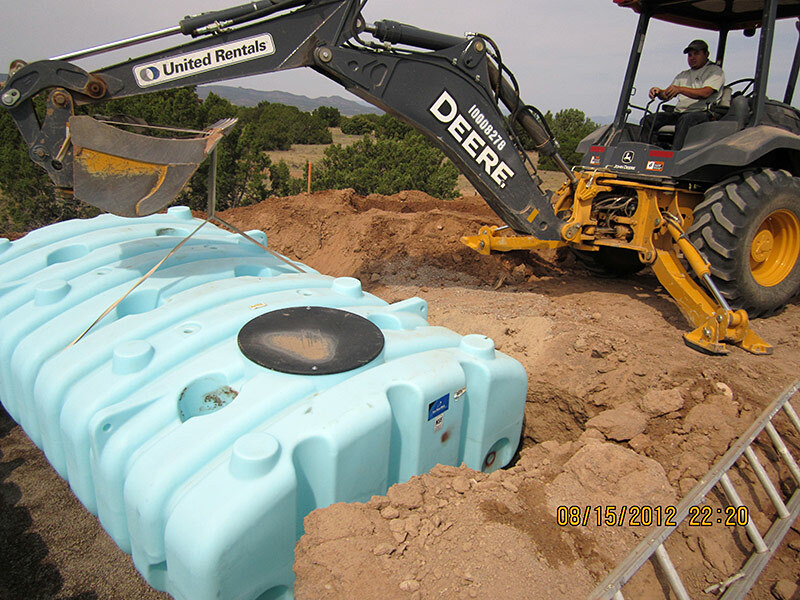 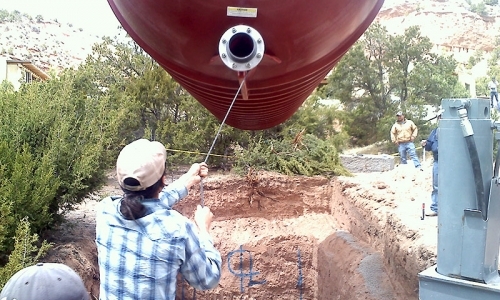 Settling a 2,500 gallon cistern in place using a backhoe. 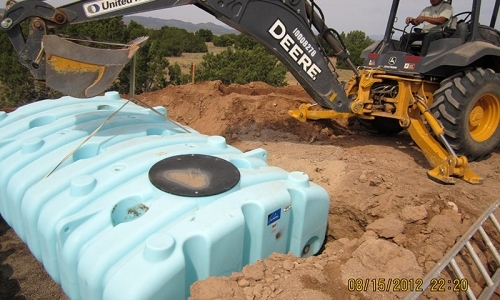 Same system showing how each 2,500 gallon tank is installed next to another. 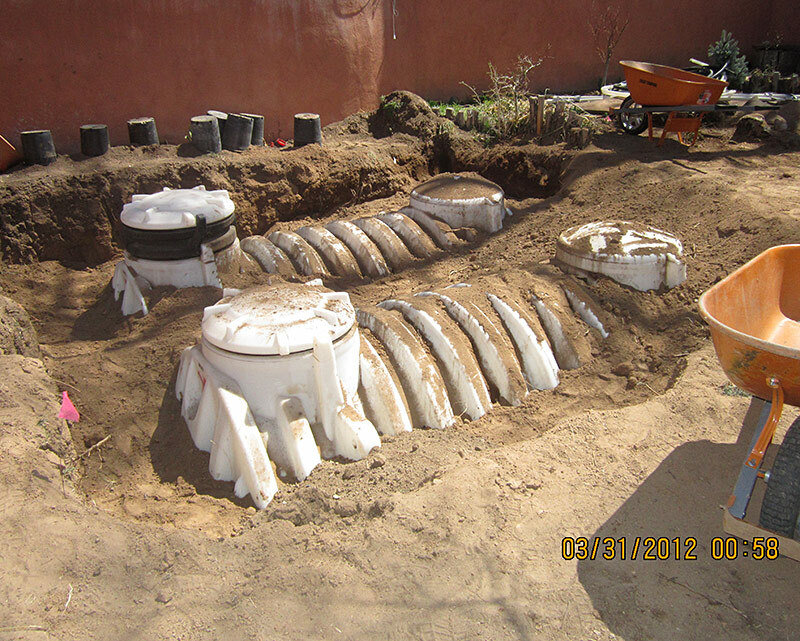 All three 2,500 gallon cisterns in place and ready for backfill and soil compacting.